The South Korean government will mobilize short-term emergency measures to fight the country’s staggeringly low fertility rate such as by expanding state subsidies for couples’ seeking infertility treatment. The government will also raise the paternity leave allowances for families welcoming their second child. 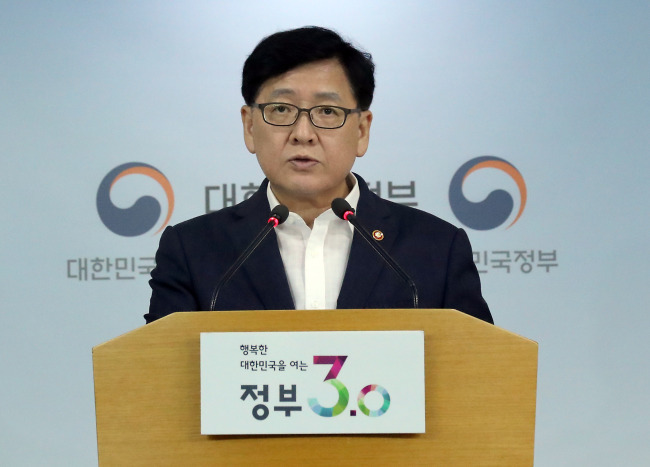 The Ministry of Health and Welfare released these and other measures to fight the low birth rate during a state policy meeting presided by Prime Minister Hwang Kyo-ahn. Despite the government’s expansive measures in the past several years to raise the birth rate, South Korea has seen a continuous drop in the number of newborns. The number of newborns in the first five months of this year dropped by 5.3 percent from the same period last year. At this pace, this year is to mark a record-low number of newborns. The government aims to raise the total fertility rate from the current 1.24 births per woman to 1.5 by 2020. This means at least 20,000 more babies must be born next year. In the latest measures, the subsidies for couples receiving infertility treatment -- which had been limited to those earning 150 percent or less of the monthly average income -- will apply to all couples regardless of their income level from September. By October next year, the government plans to have infertility treatment covered by health insurance. By income, those earning more than 150 percent of the average monthly income -- which is calculated at 5.83 million won ($5,222) -- will receive 1 million won per session. Those earning between 3.16 million won and 5.83 million won will receive 1.9 million won for the treatment, while those earning 3.16 million won or less will collect 2.4 million won. With the expansion, some 96,000 people are expected to benefit, compared to the current 50,000. From July next year, those receiving infertility treatment will also be guaranteed three days of unpaid leave per year. The government has notified of such changes in the revision to the equal employment opportunity act. The plan comes in light of a consistent rise in the percentage of babies born to parents who received infertility treatment. It rose from 1.4 percent in 2010 to 4.4 percent last year. The measures also include wider health insurance benefits for treating premature babies born weighing less than 2.5 kilograms, from October. The upper limit of the paternity leave allowance will be raised from the current 1.5 million won to 2 million won for fathers who had their second child since July this year. The plan is based on recent research that husbands who spend longer hours on child care and household chores lead to higher desires to have a second child. Households with at least three children and working parents will be guaranteed prioritized admission to public child care centers regardless of their turn in the wait list. Teachers with at least three children will also be guaranteed an assignment to a desired location of work. The benefit will gradually apply to workers in public organizations in the future. For these measures, the ministry has decided to set aside some 65 billion won in next year’s budget. This is double this year’s budget for the program at 42 billion won. “The government prepared such emergency measures with a desperate mind that we must exert all possible efforts to block the current low birth rate that continues to decline,” said Health Minister Chung Chin-youb. Chung also urged for cooperation from the business, societal and religious sectors.